Mindi Reid, an amazing principal (who used to live in Indiana but has now moved south) and member of my PLN extended this challenge to me. Check out her blog here! I also don't plan on tagging 11 people because Teacher-Librarians from all over will be discussing the 11 questions about libraries on #TLChat, January 13, at 8 pm EST on Twitter. If you'd like to elaborate on your answers and post on your blog, I would LOVE to read them. 2. What is one app or resource you’ve learned about on Twitter that has been a game changer for you at work? 3. What is your typical bedtime? I'm a night owl. I usually stay up until midnight or so, reading and talking on Twitter (yes, even on school nights). 4. Best book you’ve read in 2013? I love to read (comes with the job description) and read many books in 2013. The one that really stuck with me, the one I shouted my praise for on twitter and on The Nerdy Bookclub blog was Counting by 7s by Holly Goldberg Sloan. One of the first chats I ever participated in was #titletalk with Colby & Donalyn. It's still one of my favorites. 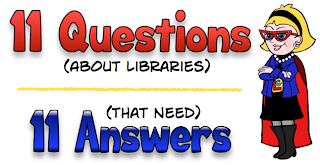 I also LOVE #TLChat and lurking in #SatChat. 6. Best place you’ve vacationed? Give me a beach and I'm blissfully happy: sun, sand, ocean and nothing to do except read and plan where to eat dinner. I love vacationing at the Outer Banks every summer. 7. How has your PLN impacted you? My PLN has impacted me immensely and has helped shape the educator I now am. Daily I am challenged and inspired by my PLN on twitter, their blogs, and beyond. I consider many of my PLN members personal friends and have had the pleasure of meeting several face to face over the past year and a half at national conferences. I am grateful daily for joining Twitter. It has expanded my thinking and taken down the walls in my library. 8. What motivates you each day to be an educator? I am motivated daily to be an educator by my love of students and my passion for sharing books and technology. 9. What was the most amazing lesson you ever facilitated or observed? Recently, I decided to participate in the Hour of Code lessons with our middle school students. I truly wasn't sure how it would go, but was amazed! It wasn't that I taught an amazing lesson, but we (6th/7th grade math teacher) facilitated and then got out of the way for students to be engaged, learn, and collaborate with each other. I am still seeing the ripple effects from that one hour/class period each class was given in December. 10. If you had a whole day to do just what you wanted, what would it be? As I sit here in my pajamas at 11:30 on a Friday, I've had a week of just that. With the snow storm we've had an unexpected extra week of Christmas break. I've cooked, read, blogged, watched Netflix, played games, wasted time on the computer, ran on the treadmill, and have been pretty lazy! 11. Favorite tv show when you were growing up? These will date me, but I loved The Cosby Show, Magnum P.I., The A Team...and many more. These are definitely tough questions...and I'm honestly still thinking and reflecting on them a lot. 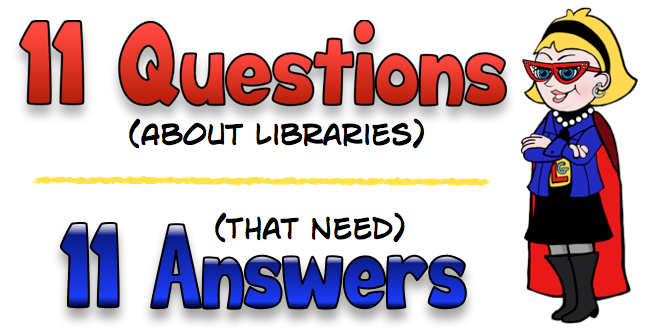 I look forward to reflecting on these questions together during our #TLChat and know that through discussion, my ideas and reflections will grow. I will give 100% every day, even on those days when I don't feel like it. My students deserve it and need to know we're in this learning thing together. I will notice them, talk to them, build relationships with them, but most of all they will know I care about them. I will continue to make the library a welcoming place for all students and be their safe place. I want to be a pivotal part of our schools K-12 as an instructional/technology leader, consultant, and collaborator. I want my principal(s) to utilize me in this manner however they see fit. I am meeting with my direct administrator this week to further explore this topic and make sure our goals are aligned for our school and library as we move forward. I want to look more closely at the needs of students and staff, but know they are more than just data and numbers. I want my instruction to be woven into what students are doing daily in other classes. I don't want to teach skills in isolation. I want to continue to give students a voice in programming decisions. Success will be measured through circulation numbers, attendance in activities, but also through student feedback. I will be purposeful in what I spend my time doing in the library. Teaching and working with students, and making those personal connections is more important than being able to process a stack of books without interruptions. I will share what I learn at conferences and from my PLN daily. I want my work with students to be integral to their success and not an "extra". I will continue to share year end information in my annual report, but I will also strive towards sharing information monthly with staff, students, and community members through social media and our webpages. I want everyone to feel welcome in my library and for everyone to find something that interests them in our space. I will continue to listen to students and give them a voice in selecting what is ordered for the library and in the types of clubs and activities we have. I will continue to reach out to staff and students with the library being a welcoming place of controlled chaos! No shushing allowed! Instead... a controlled chaos of students actively engaged in learning! 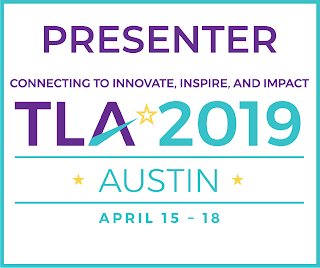 I will continue to connect on Twitter, attend conferences, and be involved in my state and national library organizations (AISLE, ILF, ALA, AASL, ISTE). I also would like to connect more locally with other teacher-librarians. I will continue to share what I am doing in my library, even when it seems insignificant. I will blog about lessons, ideas, happenings and share on social media with my PLN and community. How will you make sure everyone who walks into the library sees a focus on students (instead of stuff)? I think the proof is in the pudding. When others enter my library, I think it's quite apparent that I'm all about the students. I hope this is true.